As for those who were held in high esteem—whatever they were makes no difference to me; God does not show favoritism—they added nothing to my message. Imagine an exclusive country club that has been in existence in a community for hundreds of years. The club, created by the town’s wealthy and politically powerful founder had always been owned and run by the eldest child in direct generational descendant of the town’s founder. For generations the club has always been “Members Only” and only the “who’s who” of the community leaders, political leaders, business leaders, and established local families were allowed to join. Only they could afford the dues and abide by the upscale dress codes and the strictly taught and practiced rituals of the club’s exhaustive book of social etiquette. Then, the current owner dies. In her last will and testament she states that the Club will now be open to anyone who wants to join, not only members of the local community, but anyone from any community in the entire region. She leaves an endowment that pays for virtually anyone to belong and states that nothing should hinder any persons full acceptance and membership. From that point on, all members of the club will participate in its ownership and have the opportunity for club leadership. Almost immediately, residents across a ten county area from every social strata, race, gender and cultural background rush to join the club. The existing club members who have only known the club to be one thing, are quickly thrown into a panic. While trying to maintain an air of acceptance and openness, they insist that all of the “new” members must maintain the traditional dress code (clothes none of the “new” members can afford) and the strict rituals of social, club etiquette (that none of the “new” members ever learned, nor do they necessarily care about). The Board of Directors and its membership committee, packed with long-term, upstanding club members agree to embrace the owners wishes to welcome everyone into the club, but insist that the new members must hold to all of the long-held traditions of the country club even if it’s a terrible burden to them and offers no real benefit. One influential member from one of the oldest, most well-established blue-blood families in the club’s history stands and confronts the Board and membership committee. The owner’s last will and testament said that “nothing should hinder any persons full acceptance and membership.” To expect new members to buy expensive dinner clothes and hold to social rituals they’d never learned was the exact kind of hinderance that the owner was referring to in her will. He demands that they drop their requirement of historic dress codes and social etiquette rituals. Can you feel the tension of this situation? Welcome to the first century Jesus movement. It’s hard in today’s world to understand just how huge a rift the risen and ascended Jesus created among early believers from different backgrounds. The Jewish believers came from a deep historical and cultural tradition that was a core part of their identity. In many ways it was like a private, “members only” club. When Jesus made it clear that His followers would embrace persons of every tribe, nation, culture and tongue He opened up the proverbial can of worms. It deeply rattled those who had lived their whole lives in a system of exclusivity. As Paul continues to write his letter to the Galatians, the subtext of his words drips with tension. Paul is a life-long, blue-blood member of the formerly exclusive club. Peter, James and the rest of the Twelve are in Jerusalem trying to balance the enraged emotions and daily struggle of traditional, Jewish believers trying to embrace the new reality. Paul, the maverick, has gone all-in on the side of the non-Jewish Gentiles. This is the conflict threatening the faith of the early believers. Paul is convinced that the believers must let go of the ancient Jewish traditions and rituals of their members only club as it relates to non-Jewish believers for whom these traditions and rituals are totally foreign and meaningless. He sees Peter and the other leaders as equivocating and trying to accommodate the powerful, established Jewish members of the new paradigm. Paul is pissed off, and is not going to shy away from a confrontation on the subject. This morning I’m reminded that the struggles we experience in this time and place are not new. I’m reminded that learning to work together, embrace one another, love one another, and accept one another despite our differences is always going to be a messy human endeavor. My job, as I see it, is to follow and abide by the law of love that Jesus modeled and called me to obey. Following Jesus should always lighten the load, not increase the burden. 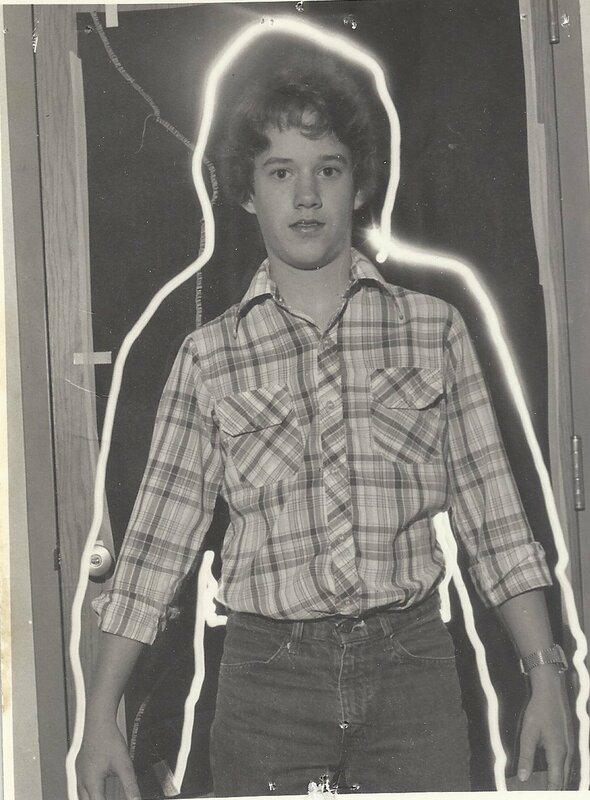 For Throwback Thursday I’m going all the way back to 1980. Much of my love of photography took root while I in the Photography Club at Meredith Junior High School in Des Moines led by my guidance counselor, Mr. Stearns. Several years ago Mr. Stearns, who happened to go to the same church as my folks, was going through a bunch of old photos and happened upon these photos and gave them to my parents to pass on to me. 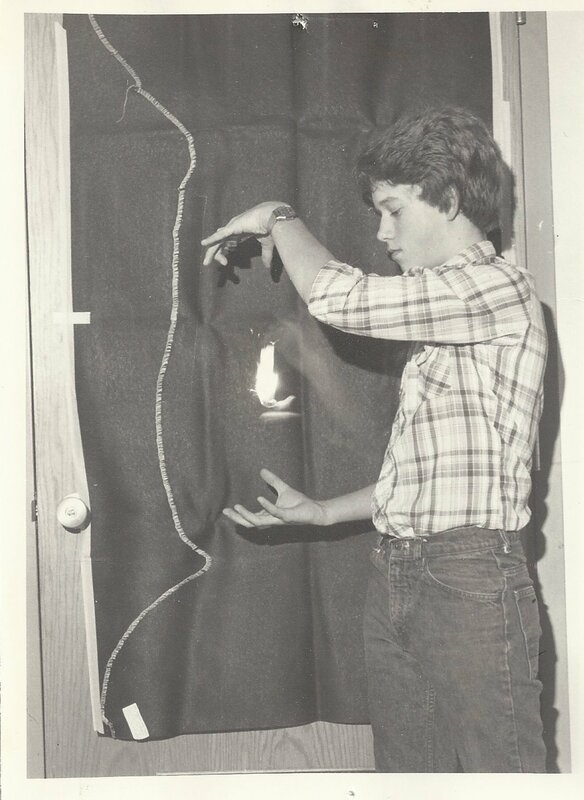 We were experimenting with “bulb photography” in these photos which were taken in the school’s dark room. That light spot in between my hands in the top photo is the flame from a lighter. The white lines around me in the second photo was made using a pen light. Basically, with bulb photography you get in a pitch dark place and open the shutter of the camera and keep it open. Then you use a pen light, flame or some other light source which is imposed on the negative. You set of the camera’s flash to impose the rest of the image in the scene. I used the same technique with a young Taylor in the basement one morning. In the shot below, I told Taylor to put out her arms and hold still in the pitch black basement. 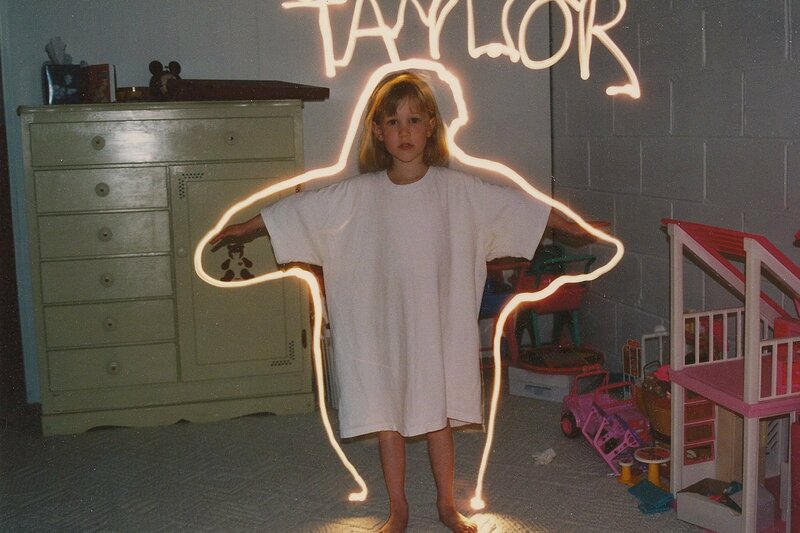 I opened the shutter using the “bulb” feature on my camera and then moved behind Taylor and used a pen light to outline her and wrote her name backwards in the air. I shut of the pen light, made my way in the darkness back behind the camera, set off the flash, and closed the shutter. It’s kind of a fun effect.